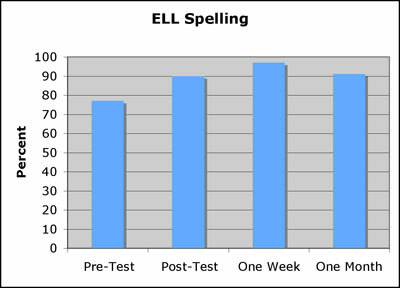 After implementing the computer program, Essential Skills' Sight Words, to the targeted groups, the students showed an increased sight word acquisition that was transferred over to their journal writing, spelling, reading recall, and comprehension. This data was collected over a period of 45 days. Growth was evidenced through academic performance as measured through flashcards, spelling tests, reading recall questions, comprehension questions, and student journals. The charts below show the results of pre-test, post-test, one week later, and one month later testing results. The results are grouped as ELL students and Title I students, respectively. 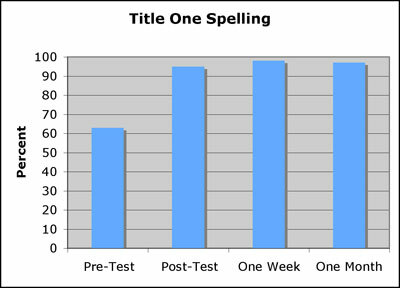 The results for Spelling showed marked improvement from Pre-Test to One Month Post-Test. This growth reinforced our belief that the Essential Skills Sight Words program would have a positive effect on students overall reading skills. The whole experience made me think that the Essential Skills Sight Words software was a valuable tool to aid students in acquiring sight word recognition. The students enjoyed working on the software. One student was noticeably distressed when the sections on typing the list words appeared. I noted that this student found most challenges intimidating. The others accepted the work and did not want help when asked if they needed assistance. I realized that these second graders had experience in the computer lab and were used to using a keyboard. The Essential Skills software is very user-friendly. The many sub-components for each list are varied, entertaining, and fun for the children. They want to go on the computer when they come to reading class so this was not something foreign or intimidating for them. Overall, I would say the students enjoyed not only the Essential Skills Sight Word program, but also the other components that reinforced their word knowledge. After reviewing our journals and analyzing the data from this action research, we concluded that the Essential Skills software should be a part of the Title I and ELL Programs here at Alden-Hebron District 19. We feel the results of this research proved that this software was beneficial in students' acquisition of the sight word vocabulary so essential to reading. We believe the best learning happens when students are having fun and feel comfortable. This research prompted us to approach our principal and ask if we may present our findings to fellow educators at an in-service since we do have a site license for Essential Skills - "Sight Words" computer program. All students would benefit from utilizing this software. It is our hope to convince our colleagues to include this software as part of their reading curriculum and use it in our updated computer lab. We are scheduled to present our findings at the next institute day after Winter Break.